For 17 years Mike performed full time at Al's Magic Shop, Washington's oldest magic establishment. During a 1985 visit to the shop, Vice President George Bush watched Mike perform and said, "This guy is good!". Within the magic fraternity, Mike is well respected. As a member of the International Brotherhood of Magicians, he was appointed territorial representative for the Washington DC area for two consecutive years. has appeared in front of over 2 million elementary school children. His “Ultimate” School Assemblies delight children with their mix of education and magic! He has appeared in every major theme park in the United States including Universal Studios, Walt Disney World, Knott's Berry Farm, Six Flags Texas and Six Flags America. His appearances include The White House, Disney Cruise Lines and halftime appearances at The Washington Redskins football games. Most recently, Romano was chosen to open for First Lady, Michele Obama at the “Read Across America" celebration at the Library of Congress. is Washington DC’s premier celebrity in children’s entertainment. He performs over 500 shows a year and is recognized by children everywhere! Louis has won Nickelodeon’s award for Best Party Entertainer in the Washington DC area. Louis and his wife Lynn produce “The Kapital Kidvention”, the largest convention in the United States for children’s entertainers. 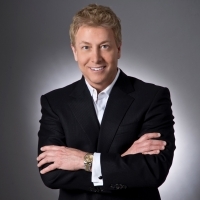 Louis is considered an expert in the field of family magic and is a sought after speaker around the county. Currently Louis is the President of The International Brotherhood of Magicians, Washington DC chapter. The “IBM" is one of the largest magic organizations in the world. Every kid will have fun developing these skills - GUARANTEED! Our Magic Camp Program is designed to take our 8 week full course program and present it within 5 consecutive days. Throughout the week, students will participate in a full agenda of fun and inventive activities. Each day, they will receive their “trick of the day” along with a live performances by the instructors, which will help students imagine and create their own unique ways of presenting to family and friends. Followed by a breakout into groups to "Power Practice" in our unique learning technique. They will receive their secret file folder for the day, watch the "Trait of a True Magician" video lesson and have an open discussion on why each life-lesson is important to learn. 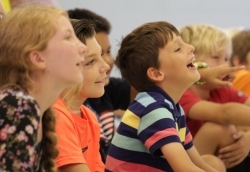 In addition to learning magic, campers are exposed to other activities such as improvisation and a variety of magic themed games that not only make memories and laughter, but also create a thirst for knowledge. SIGN UP FOR OUR NEXT CAMP! Register for half or full day! 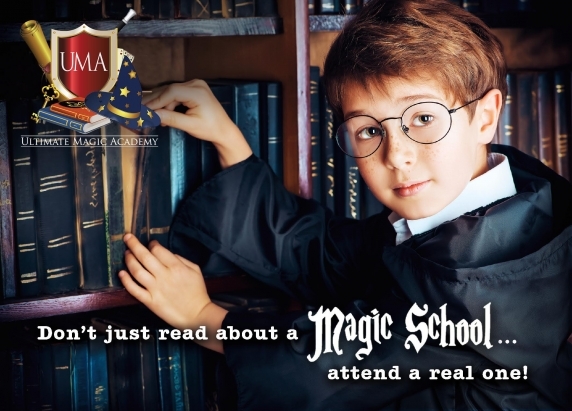 Our Ultimate Magic Academy is the perfect ending to a school day. If you are looking for a way to engage children in a fun and educational activity, our program is an exceptional choice. Magic is a great tool for building self-esteem, character and the social skills that are essential in the world today. Using magic tricks is a painless approach to teaching problem-solving strategies and even incorporating science and math so cleverly that kids don’t even realize they’re learning! Our Ultimate Magic "After" School Academy provides everything you need: entertainment, education, magic tricks and hands on instruction. DO YOU RUN AN AFTER-SCHOOL PROGRAM? Register for Thomas Jefferson ES. Register for Churchill Road ES. Students will learn the importance of being on time, being kind to their audience, and treating others the way they want to be treated. We encourage students to never interrupt or interfere when others are performing, and never brag about knowing how a trick is done! Students will learn how to be the best version of themselves. We encourage each student to refrain from trying to be something they are not. Most importantly, we encourage our students to always be truthful, and not blame others! The goals we teach are to be entertaining, and be friends to others. Students learn to introduce themselves enthusiastically. We remind them that they are performing their magic as a gift. Our "Power Practice," during class, helps students to be more prepared for performances. We teach our students what to say when they perform for family and friends. Also, the ways to engage audiences and trust in their practice, so they can have fun while performing. We teach that a true magician never brags about what they can do. They are always ready to learn more. We help students take comfort in admitting their mistakes. We also show how effectively listen to others and learning from each performance experience helps them grow! The key to humbleness is to be kind, help others succeed, give credit to others, and enjoy other people's success. We teach students how to be excited about their performance. We show the importance of smiling, using your voice to project confidence, and hand gestures to make performances magical! Students also learn how identify traits about themselves that effect a performance. Things like being too loud, and having good posture. We even talk about how sleeping well, and eating healthy can help you perform better! A true magician gives a gift to an audience. Students do this by being authentic while performing, and being humble with their skill. They give without expecting anything in return. We encourage students to be creative and create a memory. The REAL gift is the feeling they get from performing. By giving the gift of magic, both the audience and the magician can benefit from the experience. Students are encouraged to allow themselves to be different. We stress how true magicians do not take ideas from others without permission and are not afraid to fail. We help students add their own personal touch, because creativity is developed and not something we are all born with. The best way to be prepared is to always have a plan. We do this by teaching how to have everything set-up before the show. Also, knowing the beginning, middle, and end of their performances. We teach students creative ways to respond to questions like, "How did you do that? Can you do it again? I know how you did it." The experience of magic is created only by performing for and interacting with other people. By applying these eight key traits of a true magician, the magic performance will be stronger. More importantly the same qualities can also build a successful life. Most often in magic, as in life, what you do is not as important as how you do it. Learn Fun and Exciting Magic. Learn Life-Skills and Development Principles. Receive a super secret file folder for each lesson (featuring bonus tricks and lessons in magic history). Get a key card to my special online "MAGIC" vault - Unlocking new magic with a secret code each class day. Fun and interactive games with in-class videos. Custom designed "kid-friendly" tricks and supplies. Receive a special graduation surprise that will create a memory which will last a LIFETIME! Schools that sign up for one of our after-school classes will have the option of hosting a FREE assembly to promote the up-coming class. CLICK HERE TO LEARN MORE ABOUT OUR FREE PROGRAM! “What is Ultimate Magic Academy?" "What Is Ultimate Magic Academy?" Ultimate Magic Academy is a premium magic course designed by a team of award winning magicians and created specifically to help children develop critical people skills that are quickly fading in today's technology centric society. “How does Ultimate Magic Academy teach life skills?" This is not a magic class with life skills "sprinkled in"... it is a life skills course camouflaged as a magic class. Each class features one of the 8 traits of a true magician. These are the 8 important life skills we teach: Confidence, Respectfulness, Enthusiasm, Authenticity, Creativity, Humbleness, Preparedness, and Giving. The kids will learn tricks that highlight these life-skills and have access to videos that reinforce these traits. "How does Ultimate Magic Academy teach life skills?" “Does learning magic really help kids develop social skills?" 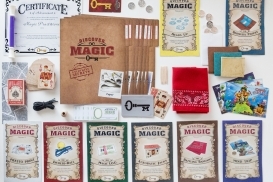 "Will learning magic really help kids develop social skills?" Yes, magic is an interactive art. We feel the most important benefits to be derived from magic come from performing for others. There is a complex cycle of verbal and non-verbal communication flowing between the performer and the people watching that is unique to magic. We’ve developed a system that will insure every child gets to perform for someone, several times, in the positive, nurturing classroom environment. “My child is really shy. Will they be able to do this? "My child is really shy. Will he be able to do this?" We have created a totally safe and nurturing environment for your child's first few performances inside every class, and try particularly hard to insure a child's confidence has every opportunity to grow from the very beginning. “My daughter is interested in magic. Will this be appropriate for girls?" "My daughter is interested in magic. Will this be appropriate for girls?" Of course! Although historically, more boys than girls get into magic, in recent years that has changed. There are more girls than ever before performing magic and the percentage of girls learning magic is increasing every year! Ultimate Magic Academy was developed with these changes in mind. “My son has already learned some magic from YouTube, will this still be appropriate for him?" "My son has already learned some magic from YouTube, will this still be appropriate for him?" Absolutely. It's unlikely he would have learned any of these specific tricks any place else. We have created custom made props, cards, and routines that can not be purchased anywhere online! Plus, we believe that just knowing the secret to how something is done is only the beginning. Additionally, the 8 traits of a true magician are unique to Ultimate Magic Academy and are exclusive to our curriculum! You won't find these in ANY other magic class in your area! “What kind of tricks are you going to teach?" "What kind of tricks are you going to teach?" 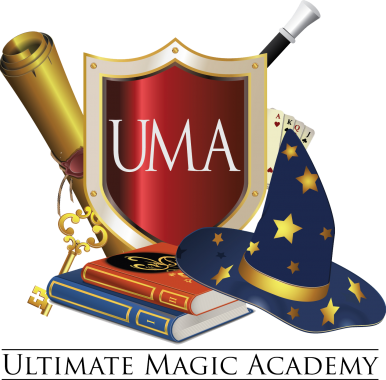 Ultimate Magic Academy features a wide range of tricks from making things appear and disappear to reading minds and passing a solid through a solid. Many of these tricks are unique to our program and they all feature a kid friendly presentation. “My child has never done magic before. Will they be able to do these tricks?" "My child has never done magic before. Will they be able to do these tricks?" Yes! Every trick is simple enough for a beginner and designed for small hands. “Will the tricks learned ACTUALLY fool adults?" "Will the tricks learned ACTUALLY fool adults?" Yes! We teach a wide variety of tricks and many will legitimately fool adults. Others may not, but they serve a purpose in teaching the kids how to respond in a variety of situations. For example, we teach the students what to say to audiences when someone says, "Can I see that?" or "I think I know how you did that." “My child has never expressed interest in becoming a magician is that ok?" "My child has never expressed interest in becoming a magician is that ok?" You betcha! Even if your child has never expressed interest in magic, most kids love watching and learning magic tricks. Our main purpose is to make sure your child is having FUN! This is why we include several fun games that kids get to play in each class. However, its not unusual, after the first class that kids are excited and THRILLED to be learning the secrets to magic!